Peas, sugar, food acid (sodium citrate), mineral salt (sodium carbonate). Cooking Instructions 1. Empty Peas into 2 cups (500mL) of COLD water. 2. Cover, bring to the boil and simmer for 3 minutes, or until tender. Drain and serve. Microwave Instructions 1. Empty Peas into an 8 cup (2 litre) microwave safe dish. 2. Add 2 cups (500mL) of COLD water. 3. Cover and cook on HIGH for 5 minutes, then on MEDIUM for 7 minutes. Drain and serve. Australian Standard metric measuring cups and spoons are used. Have a meat-free Monday with this quick and easy Asian stir-fry. You’ll have dinner on the table in 20 minutes, and a new family favourite to add to the recipe book! Roasts are not roasts WITHout these. THEY need to be MERCHADISED higher on the shelf when they come back. After 49 years i can't buy surprise gardenpeas any more. I've never bought anyothers and I am bitterly disappointed! Why have they been deleted, these are the only peas that my family will eat. you must bring them back. I give 5 stars for the product, however zero for deleting them. Is there any stores around the Sydney are which still has them. These are the best peas. we have been using these peas my whole life, and i'm 54 now. i'm so upset that i can't get them anymore. the other brand peas are dreadful, and, unfortunately, so are the minted peas. I CANNOT FIND THIS PRODUCT IN WOOLWORTHS OR cOLES OR IN IGA IN SYDNEY (SUTHERLAND SHIRE). 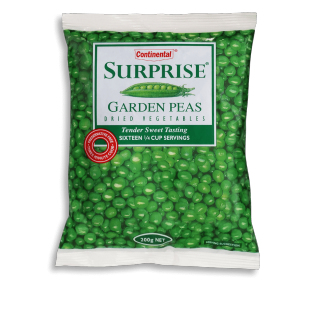 I HAVE BOUGHT THIS PRODUCT FOR A LONG TIME AND I WOULD LIKE TO KNOW WHO HAS SUPRISE PEAS IN STOCK. Sorry to disappoint you, but our Surprise Peas have been deleted from our range. You can still find our Minted Peas in Woolworths stores. I have given 5 stars for the product and 1 star for coles and woolworths to share for not stocking this product. best peas around. because they were always on the bottom shelf is why they had low sales. the home brand peas taste terrible. Sorry Cath, but we have bad news for you. Our Surprise Garden Peas have actually been deleted due to poor sales & low distribution.